The Co-op is one of the world’s largest consumer co-operatives, with over 4 million active members. Its purpose is ‘Championing a better way of doing business for you and your communities’. 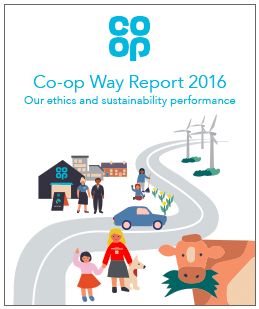 Today the Co-op announces the launch of its latest sustainability report, available as a summary Overview and also a more detailed Performance Data section. With a focus on how the 'Co- op Way' is a better way of doing business, the Report details progress and performance across nine key priorities. The Report is independently assured and is in accordance with GRI G4 (core). For the first time the Co-op also report against the Sustainable Development Goals.